One of the seminars I’ll be taking at the MFA residency focuses on writing non-fiction for young people. The professor wants to read and bring in a non-fiction book, and gave us a nice list of readings we could pick from, if we chose. As much as I trust her judgment in books, I decided to take this chance to read Me . 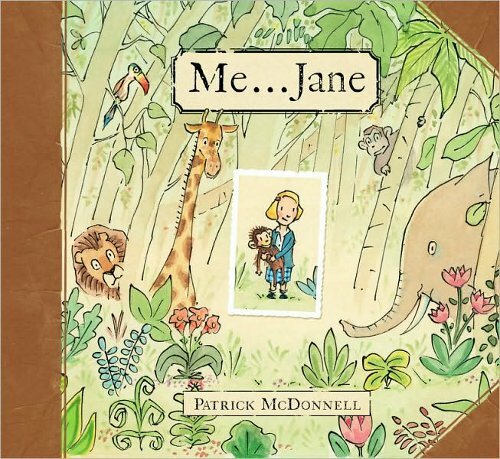 . . Jane , a biography of Jane Goodall by Patrick McDonnell. I think I made the right choice. Me…Jane focuses on Goodall’s early years, starting with the day she was given a toy chimp: “Jane had a stuffed toy chimpanzee named Jubilee.” We are then shown how much Jane loves to be outside and watch the animals. She even likes to study them, drawing pictures and taking notes (we’re given an interesting two-page spread of these, showing how passionate and meticulous the young Goodall was). She hides in a chicken coop to see where eggs come from, “and observed the miracle.” Small Jane climbed a tree to read about Tarzan, and dreamed of going to Africa. She imagines giraffes and elephants, and that she is swinging through a jungle. At the end she falls asleep, and then awakes an adult, “to her dream come true.” The last image is the only photograph, as she reaches and touches fingers with a baby chimpanzee. The art is very cute, drawn by the same person who created the newspaper comic Mutts. While I’m not a regular reader, I’ve always found that comic charming and heartwarming. That charm is visible here as Jane smiles at every animal, and Jubilee could be real as Jane holds his hand. The art is also still simple enough that any little girl could imagine herself as Jane, dreaming her big dream and watching it become real. That’s also why I like the photograph at the end of the book; going to Africa is no longer some fantasy, but something that actually happened, because she wanted it so badly. Jane Goodall has done a lot of good in her adult life, as the more direct biography at the end of the book explains. But it’s so much easier to feel close to and happy for a person when you see her as a child, and McDonnell does a fine job of creating that empathy. There’s no large drama in this book to make it exciting, but Me…Jane is an uplifting, and empowering, story.